This is Camille’s dog, Gadget, our ringbearer for the wedding. 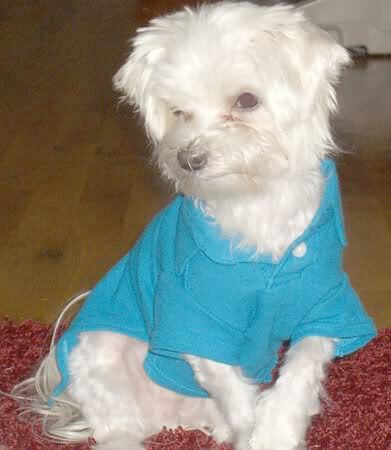 He’s modeling his new polo shirt in this picture, but I just special-ordered his puppy tuxedo for the wedding. Isn’t he adorable? Thanks to one of my bridesmaids Camille, we have discounted room rates of $70 and $76 per night at the Miyako Hotel and the New Otani Hotel for our wedding guests. So if you’re coming to Los Angeles from out-of-town for our wedding, or you’re from Los Angeles but you don’t want to drive home after our reception, make your reservations at either hotel, but make sure to email us your name, hotel, and the dates you’ve booked. We’ll provide the hotel with our guest list and they’ll make the rate adjustments. We sent another big batch of invitations out yesterday, so they are all out there except for those we forgot and a few that needed to be re-addressed. We have started to get a trickle of reply cards back, but today we received an empty reply card envelope! So if you mailed your reply card yesterday from the Los Angeles area, you might want to drop us an email or give us a call, since we may not have actually received your reply. And if you got your invitation and have not dropped your reply card in the mail yet (or done it online), please do so!